Anyway, I'm back with a weigh in and this week its a gain. I knew the loss wouldn't last forever, especially as I've been a bit of track of recent. I'm actually amazed it was only a gain of 1.3lbs, but still a gain is a gain. I thought I wouldn't be too bothered but I actually was really gutted. I knew it was coming. I've had a crazy week and been so stressed and I naturally turn to food when stressed, I know its not the thing to do but its natural to me I'm hoping to get over this when I've learnt to eat healthy and drink more. I kind of feel that I needed it though, I've not been tracking and therefore anything I didn't write down didn't count in my head so I needed the kick up the bottom with loosing previously. Anyway, I'm hoping this next week I can get back on it I've done incredibly well up until now with the losses each week. I really cannot wait to see more changes so it would be devastating to give up now. On Monday, I wore a top I hadn't worn in a while and it fitted so much better, my jeans were falling down but I do think they are possibly incorrectly labeled but still. If you would like to feature the #WeightLossWednesday badge, please take this code! Don't forget to tweet us! 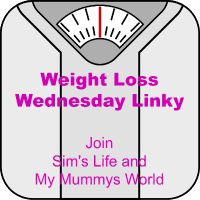 @SimsLifeBlog and @MyMummysWorld with #WeightLossWednesday!